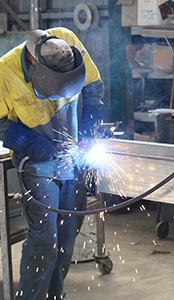 Whilst PJN Steel Fabrication is based at Walla Walla, in southern New South Wales, their sheds can be found all over New South Wales and Victoria, and also into South Australia, Queensland and Tasmania. PJN Steel Fabrication was established by Phillip & Katrina Nadebaum as a family owned company in 1985 and continues today with the second generation now firmly involved in the operation and running of the business. As the business has evolved and grown over the years PJN Steel Fabrication have continually embraced advances in manufacturing technology and processes, some of which can be seen here. This ensures not only strong quality control, but also price competitiveness. After close to 30 years in business, PJN maintain their original concept of dealing direct with the principal of the business, ensuring that every step of the process is managed by Phillip. Timing of delivery is discussed with you; the client, to ensure it fits in with your program. Naturally the erection of your building is programmed in with your delivery, with the erectors arriving within 1-2 days of delivery (guaranteed). Forget the sad stories from other shed suppliers of having a delivered shed but no erectors (or worse, having to arrange your own erectors) - this does not happen with PJN. All of these arrangements are made directly with Phil prior to delivery. The range of buildings is designed using structural steel framework offering significant strength advantages over many other buildings available today. PJN sheds are available in large range of configurations and colours with the standard range of buildings designed to offer maximum efficiency. Alternatively the expert team at PJN have the ability to provide custom designs to suit your specific requirements. PJN provides free no obligation quotes and looks forward to the opportunity to provide assistance with enquiries regarding rural, commercial and industrial buildings.